It's steps from your condo - slip on your flip-flops and go. See whose reflexes are quicker in the onsite game room. Huge arched windows invite the light in when it's too cold to brave the outdoor pool. Lights dimmed, popcorn popping, seats claimed - annnnd Action. Don't let your week fly by without a few evenings reserved for the balcony. Close to Silver Dollar City, the Titanic Museum and Mount Pleasant Winery. Visit White Water Park at Silver Dollar City. Surrey’s Carriage Place is located in the heart of Branson, Missouri. Once you get settled into your condo, get changed into swimsuits, grab goggles and pool toys and slather everyone head to toe in sunscreen. The natural stone, ponds and fountains and tons of shade trees make even the short stroll to the outdoor pool an absolute delight. Taking a break from the sun? The indoor pool’s plentiful windows keep things light and bright while keeping the kids out of the danger zone for burns. Teens and grown-ups over the age of fourteen will love the game room and little ones will have a blast on the children’s playground (and burn off their energy just in time for their afternoon nap!) Plan at least one dinner on the outdoor BBQs. Recruit the kids to help carry burgers, hot dogs, and side-dishes. Then lay out the condiments and toppings and let everyone have at it. Snag a table fountain-side for extra ambiance. Junior one-bedroom and one-bedroom condos sleep four guests. Kitchenettes have what you need to make the basics. Head to the Country Mart to stock up on groceries. Two- and three-bedroom condos sleep six to eight guests. Full kitchens have everything you need to make everyone’s favorites. The kids will be begging to help bake your famous sugar cookies (and be the official taste testers). And freezers are perfect for storing dessert – popsicles for the kids (and a Ben & Jerry’s stash for the grown-ups). There’s even a washer/dryer so you can treat those popsicle drips sooner vs. later. While the laundry is going, show off your multitasking skills and catch a Friends rerun on the TV with premium channels. Have a family movie night thanks to the DVD player. Bring favorite movies from home, gather everyone on the couch, pop some popcorn and ask for a show of hands to decide what to watch first. Theatre lovers, rejoice! Surrey’s Carriage Place is just a short drive to the Branson Theatre District. It features more than one-hundred shows (more than Broadway)! Million Dollar Quartet, Legends in Concert and the ABBA Tribute: Thank You For The Music are just a few of your options. Dolly Parton’s Dixie Stampede Dinner Show takes place in a thirty-five-thousand square foot arena. It features a four-course meal and a horse show starring thirty-two horses. Ripley’s Believe It or Not twelve-thousand square foot Odditorium features the “eclectically bizarre” collection of Robert Ripley. Surprise the kids with a day at Silver Dollar City. This family theme park features over forty rides including roller coasters, a train ride, and whitewater rapids. 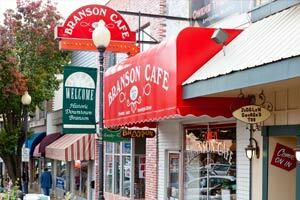 Check out the variety of stores and restaurants at Branson Landing. - Front desk is open 7:00 AM-4:00 PM. Guest that arrive outside of normal front desk hours must check in at Grand Crowne Resort located at 300 Golfview Drive Branson MO 65616.